Aug. 2, 2018 - Norbord Inc. has reported Adjusted EBITDA of $273 million for the second quarter of 2018 versus $165 million in the second quarter of 2017 and $170 million in the first quarter of 2018. The 65 per cent year-over-year improvement is primarily due to higher North American oriented strand board (OSB) prices and shipment volumes, as well as higher European panel prices. North American operations generated Adjusted EBITDA of $256 million compared to $157 million in the same quarter last year and $156 million in the prior quarter. European operations delivered Adjusted EBITDA of $21 million versus $9 million in same quarter last year and $18 million in the prior quarter. Norbord recorded Adjusted earnings of $167 million or $1.92 per diluted share ($1.93 per basic share) in the second quarter of 2018 versus $95 million or $1.10 per share (basic and diluted) in the second quarter of 2017 and $96 million or $1.10 per diluted share ($1.11 per basic share) in the first quarter of 2018. Adjusted earnings exclude non-recurring or other items and use a normalized income tax rate. In North America, year-to-date US housing starts were up eight per cent versus the same period in 2017, with single-family starts, which use approximately three times more OSB than multifamily, also increasing by eight per cent. The consensus forecast from US housing economists is for approximately 1.31 million starts in 2018, which suggests a nine per cent year-over-year improvement. North American benchmark OSB prices increased significantly during the second quarter of 2018 as end-use demand remained robust during the prime spring homebuilding season. Average benchmark prices were significantly higher than both the prior quarter and the same quarter last year. The North Central benchmark OSB price was steady through April, increased in May before stabilizing at its year-to-date high of $445 per Msf (7/16-inch basis) for all of June. The logistics challenges that first materialized in the Western Canadian region during the first quarter began to ease late in the second quarter. As a result, the Western Canadian benchmark price finished the quarter below the North Central benchmark, but was still 12 per cent higher on average quarter-over-quarter. In Europe, panel markets continued to strengthen, driven by robust OSB demand growth in Norbord’s core markets. In local currency terms, average panel prices were up 27 per cent versus the same quarter last year and up five per cent from the prior quarter. North American OSB shipments increased nine per cent year-over-year and 10 per cent quarter-over-quarter due to seasonally higher productivity and uptime, as well as additional production from the Huguley, Alabama mill that restarted during the fourth quarter of 2017. Norbord’s specialty sales volume (including industrial applications and export markets) increased by nine per cent year-over-year and represented approximately 25 per cent of the company’s North American OSB sales volume. Excluding the curtailed Chambord, Que., mill, Norbord’s operating North American OSB mills produced at 98 per cent of stated capacity, compared to 99 per cent in the same quarter last year and 94 per cnet in the prior quarter. Capacity utilization declined slightly year-over-year due to the inclusion of the Huguley mill, which remains in ramp-up mode following its restart in late 2017. Quarter-over-quarter, capacity utilization increased due to improved productivity and seasonally faster line speeds compared to the particularly harsh winter weather conditions in the first quarter. In May, the company temporarily suspended production at its OSB mill in 100 Mile House, British Columbia for approximately three weeks due to a temporary wood shortage. The significant wildfires that the province of British Columbia experienced in the summer of 2017 seriously damaged logging areas surrounding the 100 Mile House mill. Further, the severe weather conditions this winter limited loggers’ ability to access the forests during the months when the mill typically builds its annual log inventory. Combined, these extraordinary circumstances impacted Norbord’s ability to secure a sufficient wood supply to operate the mill on a continuous basis during this period. The curtailment negatively impacted second quarter 2018 financial results by approximately $3 million. Norbord’s North American OSB cash production costs per unit (before mill profit share) increased five per cent compared to the same quarter last year due to the stronger Canadian dollar as well as higher resin and fibre prices, partially offset by improved productivity and the timing of annual maintenance shuts and related costs. Unit costs decreased four per cent versus the prior quarter due to improved productivity and raw material usage, partially offset by higher fibre prices. Higher fibre prices versus both comparative periods are primarily due to the impact of last year’s wildfire season on the 100 Mile House mill’s wood supply. In Europe, Norbord’s shipments were six per cent lower than the same quarter last year and three per cent lower than the prior quarter due to shipment timing. The European mills produced at 89 per cent of stated capacity in the quarter compared to 105 per cent in the same quarter last year and 86 per cent in the prior quarter. Capacity utilization increased quarter-over-quarter due to improved productivity, but decreased year-over-year due to the restated annual production capacity to reflect the new OSB continuous press line at the Inverness, Scotland mill that was substantially completed in the fourth quarter of 2017. Production from the expanded Inverness mill will not significantly increase until 2019 when the new finishing line installation and commissioning are complete. Year-to-date, the Company generated $6 million of Margin Improvement Program (MIP) gains due to a richer product mix, improved productivity and the timing of planned annual maintenance shuts and related costs, partially offset by costs associated with executing on strategic initiatives. MIP is measured relative to the prior year at constant prices and exchange rates. Capital investments were $54 million (including intangible assets) in the second quarter and $104 year-to-date. Norbord’s 2018 capital expenditure budget is $200 million, including the Inverness finishing line, Chambord rebuild, Grande Prairie debottlenecking and Huguley woodroom projects (as described below), as well as other projects focused on reducing manufacturing costs and increasing productivity across the mills. In addition, it includes investments to support the company’s strategy to increase the production of specialty products for industrial and export markets. Included in the year-to-date capital investments is $8 million for the Inverness, Scotland mill modernization and expansion project. The original two press lines were demolished during the second quarter of 2018 and a new finishing end will be installed during the second half of 2018. Total capital spending to-date for the project is $142 million. The project cost is expected to total $145 million, seven per cent above the $135 million budget due to significant fluctuations in the relative values of the Pound Sterling, Euro and US dollar currencies over the two-year life of the project. Also included in the year-to-date capital investments is $30 million for the Grande Prairie, Alta., debottlenecking project. The Grande Prairie mill is one of the largest single-line OSB facilities in the world, but the mill is currently bottlenecked in the areas before the forming line and press. The Company is undertaking a project to redeploy the wood handling, heat energy and drying equipment from the unfinished and unused second production line to debottleneck the existing first line. Upon completion in the second half of 2018, the mill’s production capacity is expected to increase by 100 MMsf (3/8-inch basis) to support growing demand from key customers. Further savings are expected to be realized through reduced wood and natural gas usage. The project is budgeted at $55 million. Norbord believes North American OSB demand will continue to grow. In order to support this anticipated growth, the company’s board of directors has approved a $71 million investment to rebuild and prepare the Chambord, Que., mill for an eventual restart. The company has not set a restart date, however, and will only do so when it is sufficiently clear that customers require more product. This project involves replacing the dryers and investing in the wood-handling and finishing end areas to debottleneck the mill’s manufacturing process and reduce manufacturing costs, as well as upgrades in process and personal safety systems, electrical systems and environmental equipment to bring the mill up to current standards after a decade of curtailment. The government of Quebec is investing up to C $4.8 million(US $3.6 million) in the project. Further, the Company’s investment will qualify for Canadian investment tax credits and Quebec’s rebate program for large electricity users which will reduce cash income taxes and electricity costs, respectively, once the mill is operational. Once complete, the investment is expected to increase the mill’s stated annual production capacity by 80 MMsf, from 470 MMsf to 550 MMsf (3/8-inch basis). Norbord is also beginning preliminary engineering work to plan for the rebuild and automation of the wood-handling section of the Huguley, Ala., mill. A similar project was undertaken at the sister Joanna, South Carolina mill in 2014, which enabled a 150 MMsf (3/8-inch basis) capacity increase from debottlenecking the continuous press production line. Operating working capital was $212 million at quarter-end compared to $181 million at the end of the same quarter last year and $218 million at the end of the prior quarter. The year-over-year increase is primarily due to the accounts receivable impact of higher North American OSB prices and shipment volumes as well as inventories attributable to the new Inverness line and restarted Huguley mill. The quarter-over-quarter decrease is primarily due to the annual seasonal log inventory drawdown in the northern mills in North America and higher profit share accruals attributed to higher earnings. Working capital continues to be managed at minimal levels across the company. At quarter-end, Norbord had unutilized liquidity of $649 million, consisting of $298 million in cash and $351 million in unused credit lines. The company’s tangible net worth was $1,441 million and net debt to total capitalization on a book basis was 16 per cent, with both ratios well within bank covenants. OSB demand is growing in the company’s core North American and European markets, underpinned by a continuing steady recovery towards the level of underlying demographic demand for new homes in the U.S., as well as increasing repair and remodel spending and expanding industrial end-uses. APA-The Engineered Wood Association data suggests the North American OSB industry was operating at close to full capacity in the second quarter, resulting in low inventories and a tight supply chain. Norbord’s North American OSB mills produced at 98 per cent of stated capacity in the second quarter. Management believes these favourable market conditions will drive significant free cash flow generation in the near term. The Company is investing $200 million in a number of high return capital projects this year, some of which will lay the groundwork for incremental capacity to supply growing OSB demand at less than half of management’s current $425/Msf (3/8-inch basis) estimate of replacement cost. 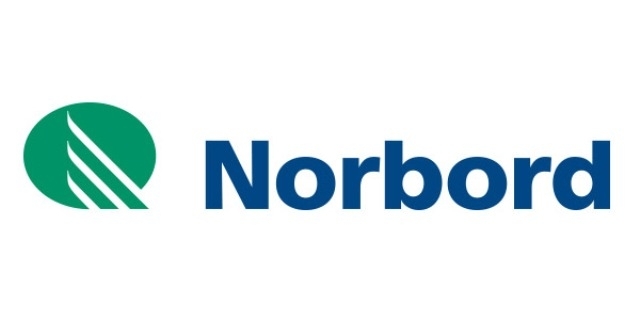 Norbord generated $2.89 per share of operating cash flow in the second quarter of 2018 and had $298 million of cash and cash equivalents on its balance sheet at the end of the quarter. In recognition of the exceptionally strong free cash flow generated during the quarter as well as Norbord’s strong financial position and outlook, the board of directors declared a dividend of C $4.50 per common share (approximately $3.42 in U.S., dollars), payable on Sept. 21, 2018 to shareholders of record on September 1, 2018. This is consistent with the company’s variable dividend policy under which the board of directors determines the dividend level each quarter, and leaves the company with over $350 million in pro forma liquidity. Given the positive outlook for OSB demand in North America and Europe driven by continued growth in the construction and renovation of homes as well as meaningful growth in industrial end-uses and export markets, the company is well positioned to continue to return capital that is surplus to its needs to shareholders. In this regard, Norbord is considering alternatives in addition to dividends, including share repurchases through its normal course issuer bid or through a substantial issuer bid. Any dividends reinvested on Sept. 21, 2018 under the company’s Dividend Reinvestment Plan will be used by the transfer agent to purchase common shares from Norbord’s treasury. Norbord’s dividends are declared in Canadian dollars. Registered and beneficial shareholders may opt to receive their dividends in either Canadian dollars or the U.S., dollar equivalent. Unless they request the U.S., dollar equivalent, shareholders will receive dividends in Canadian dollars. The U.S., dollar equivalent of the dividend will be based on the Bloomberg FX Fixings Service (BFIX) noon exchange rate on the record date or, if the record date falls on a weekend or holiday, on the BFIX noon exchange rate of the preceding business day. Registered shareholders wishing to receive the US dollar dividend equivalent should contact Norbord’s transfer agent, AST Trust Company (Canada), by phone at 1-800-387-0825 or by email at inquiries@canstockta.com. Beneficial shareholders (i.e., those holding their Norbord shares with their brokerage) should contact the broker with whom their shares are held. Norbord’s variable dividend policy targets the payment to shareholders of a portion of free cash flow based upon the company’s financial position, results of operations, cash flow, capital requirements and restrictions under the company’s revolving bank lines, as well as the market outlook for the company’s principal products and broader market and economic conditions, among other factors. The Board retains the discretion to amend the company’s dividend policy in any manner and at any time as it may deem necessary or appropriate in the future. For these reasons, as well as others, the Board in its sole discretion can decide to increase, maintain, decrease, suspend or discontinue the payment of cash dividends in the future. Norbord Inc. is a leading global manufacturer of wood-based panels and the world’s largest producer of oriented strand board (OSB). In addition to OSB, Norbord manufactures particleboard, medium density fibreboard and related value-added products. Norbord has assets of approximately $2.1 billion and employs approximately 2,750 people at 17 plant locations in the United States, Canada and Europe. Norbord is a publicly traded company listed on the Toronto Stock Exchange and New York Stock Exchange under the symbol “OSB”.